White office chairs can dress up any office space, whether you are buying furniture for a large business or for a home office. These elegant and classic chairs are modern in appearance, making any room pop with a clean executive look for a modern office space. 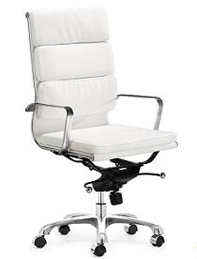 Leather office chairs are durable and comfortable, making them ideal for daily use. For doctors, lawyers, or other professionals with long hours, these computer office chairs can be the difference between a sore back and legs or a proper posture. Our business has an online ordering method and open phone lines for customers. So, no matter which style you want to have, our company can provide you with the white leather chairs you need to match your design. From modern, space-aged chairs to classic rolling chairs, we have every kind of office chair that you could need to stay comfortable while you're working. For clients, we offer conference chairs and chairs you can keep in the lobby; it's important to keep your patients and patrons comfortable, too. We can take your orders over the phone or online for your convenience. Contact us to learn more about our large selection of office chairs including leather, executive, home office, and reclining office chairs.